1. Cook the spaghetti according to the packet instructions then drain well and tip back into the saucepan. 2. Meanwhile, spray a wide non-stick frying pan with low calorie cooking spray and place over a medium-low heat. Add the artichokes, garlic and chilli and stir-fry for 2-3 minutes. 3. 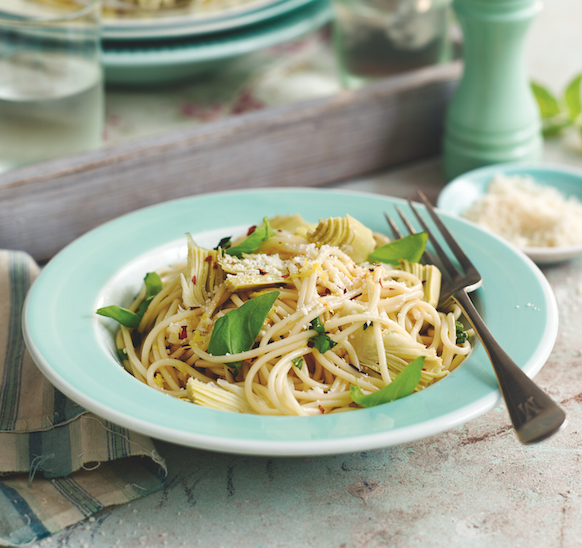 Tip the artichokes, garlic and chilli into the spaghetti and stir in the basil and lemon zest and juice. Mix well and divide between bowls. Scatter over the torn basil and cheese to serve.